Maintain full floor width between wheelwells. Positionable overhead support system eliminates obstructions. Full floor access to carry 4' x 8' sheets of plywood, paneling, sheet rock, etc. Floor Saver Shelving gives you the advantages of shelving without using up the valuable floor between the wheel wells in your van. 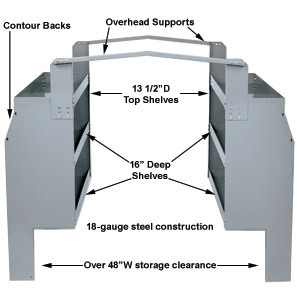 We've taken our standard contoured back heavy duty shelving and developed a unique overhead support system that allows us to eliminate the front portion of the unit side panels. In doing so we opened up the space between the wheel wells to carry 4' x 8 sheets of plywood, sheetrock, paneling, ect. 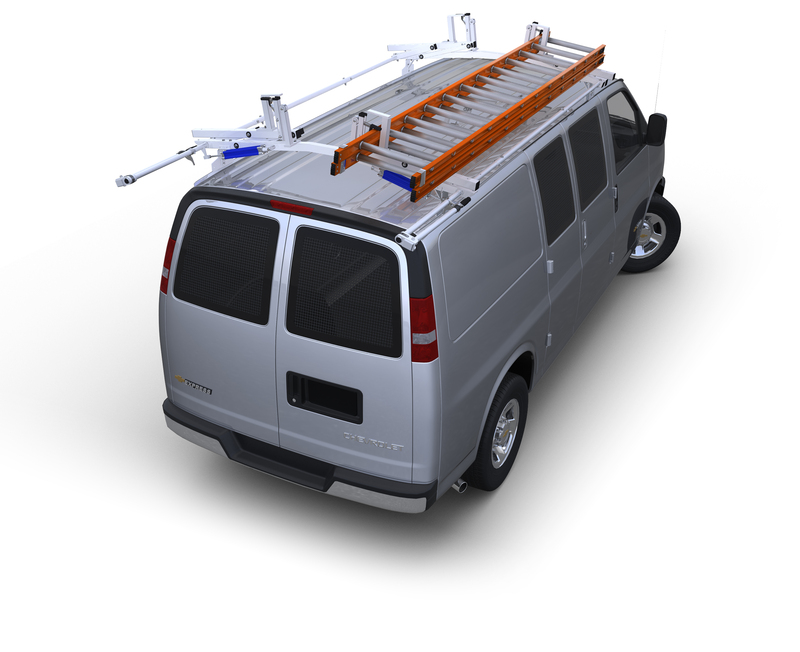 Because we utilize an overhead support system that connects the driver and passenger side units, this Floor Saver shelving unit can only be used and are sold in pairs of the same size. Units are available in 39" and 48" width and come with one 13 1/2" deep top shelf and two 16" deep shelves. Units are constructed of heavy duty steel and have a powder coat finish. Shelves are perforated on 2" centers to accept dividers.